SustainabiliTank: Vermin found at the UN – Mayor Blooomberg questions UN refusal to comply with New York City laws on health safety. At UN, Bedbugs Now In Press Briefing Room, Fleas in Basement. Questions about excessive Korean presence. Vermin found at the UN – Mayor Blooomberg questions UN refusal to comply with New York City laws on health safety. At UN, Bedbugs Now In Press Briefing Room, Fleas in Basement. Questions about excessive Korean presence. At UN, Bedbugs Now In Press Briefing Room & Al Jazeera, Fleas in Basement. By Matthew Russell Lee, Exclusive of The Inner City Press. UNITED NATIONS, November 16, updated: following report of fleas in UN basement by Inner City Press and questions, UN has confirmed the fleas. On bedbugs in the briefing room and Al Jazeera, the fumigation will not happen until November 20. With the UN still refusing to disclose the results of the bedbug tests in did after the pests’ presence was exposed, first by Inner City Press, on the evening of November 15 a bedbug sniffing dog inspected the press briefing room in the Dag Hammarskjold Library auditorium. Inner City Press witnessed it, including meeting and petting the dog, a Jack Russell named Jack. He found bedbugs on chairs in the briefing room, which the UN now says “have been cordoned off.” Bedbugs were also discovered in the studios of Al Jazeera on the second floor, AFTER the studios of BBC and NHK had been fumigated. The press corps is in an uproar. But the fumigation planned as of 6:50 pm on November 16 is only of the briefing room and Al Jazeera (not the whole second floor), and not until Nov. 20. Inner City Press: in New York now, the Health Department has a system under which the representing letter grades for health. They inspect restaurants and any other food facility. And apparently they have… they do inspect… I wasn’t aware of this, but they inspect the UNICEF cafeteria and the DC-One cafeteria, and both have received grades that would be B or in one case C. What I am wondering is whether the facility here in UN Headquarters, does the UN consider this to be outside of that system of health inspections, and if so what can it say about the… given, across the street what the grades are? And also, not to say that the two are related, but what interface has there been with the city government on this bedbug issue and what update can you provide as to the tests that you said last week were being performed in various locations, some here, some out, including one that was supposedly going to be done and or may soon be done on the 2nd floor? So it’s the food issue, and then the bedbug issue. Spokesperson Nesirky: Well, on the second, I don’t have an update, and let’s see if we can get one. I don’t have an update. But I do know, as you yourself have said, you’ve been in direct touch with the relevant people from Facilities Management Service. I am sure that if you wanted to, you could do the same again. But for the benefit of others, of course, and for you as well, we’ll see if there is an update. On the first part, health inspections, I would defer to my colleagues who liaise with the city authorities. I don’t know the answer to that. Inner City Press: Should I follow up with them or can you [inaudible]? Spokesperson Nesirky: As I said, I will see what we can find out. On what basis are the UN’s cafeteria facility at UNICEF and the UN’s cafeteria in the DC building inspected, but the UN cafeteria not inspected? Is it a legal basis? Is the UN’s main cafeteria not being inspected because the UN is forbidding the inspection? 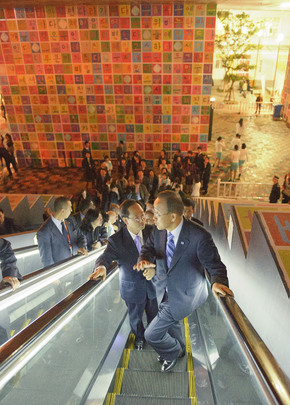 Does the SG have an objection to NYC inspectors visiting the UN cafeteria? Doesn’t the UN allow inspections from the Fire Department of the UN premises? UNITED NATIONS, November 9 — The UN’s relations with the Press range from bugs to snubs to turf wars. Since the middle of Secretary General Ban Ki-moon’s trip to China, the UN press corps has been full of questions why Ban didn’t mention the recent Nobel Peace Prize winner Liu Xiaobo. Major media outlets asked Ban’s spokesman about the omission day after day. When Ban returned, he did not hold any regular press conference. Rather he appeared one morning at 9 am to speak about climate change. When nevertheless a China and human rights question was asked — albeit one that did not mention Liu Xiaobo — Ban read from prepared notes that he had mentioned human rights three times in China. In the days after that, still no press Q&A with Mr. Ban Ki-moon. Then after holding a press availability only for the Korean media he left for the G-20 meeting in his native South Korea. On November 9 his acting Deputy spokesperson Farhan Haq announced that Ban would be holding a press conference — in Seoul. Amid the groans in the press area of UN headquarters, on the second floor of the Dag Hammarskjold Library, there was also on the night of November 8 a belated test for bed bugs. Inner City Press broke the bed bugs story, last year about the UN’s “swing space” on 46th Street and last month in the basement of the Library and then elsewhere. Tests were conducted on the Library’s first floor and third floor — where UN Under Secretary General for Management Angela Kane is based — but not on the second, where the Press offices are. Ban’s spokesman Martin Nesirky explained to Inner City Press that tests are based on requests. So a request was made. On November 8, some 90% of the cubicles of UN-based media organizations including this one were subject to a canine test, “no cameras allowed.” On November 9 the results were released: two offices were infected, those of BBC and NHK Broadcasting. We’ll leave readers to draw their own conclusions. As in Seoul Ban Ki-moon prepared for the press conference he didn’t hold in New York, on the same second floor of the Dag Hammarskjold Libary a turf war was breaking out. In what was previously in the Secretariat called the J or Japanese Room, the “K” or Korean wing is said to often sit empty. Ban at Republic of Korean pavillion in Shanghai, bugs not shown. At least one reporter for Japanese media moved in to fill the void, due to limited space for her media. A few verbal altercations ensued, until the UN’s Media Accreditation and Liaison Unit was called in. MALU has a rule that media must be at the UN three days a week to have an office. With Ban seemingly avoiding the UN press corps, any attempt to question the status or presence of Korean media organizations will inevitably be seen as more than bureaucratic. And so a fight impends. Footnote: for those who question this piece’s focus on Seoul then the Korean media, it is worth noting that this year’s UN Day concerts was even more Korea heavy that previously reported. A Korean symphony played, sponsored by Korean Broadcasting, begun by a video touting the wonders of Korea. Afterward, Inner City Press got a text message that Ban surfaced at a reception at the Korean Mission just across from the UN. Amid the bed bugs and unanswered questions, there is more and more grumbling. Watch the Inner City Press site – you can follow it also on Twitter @InnerCityPress.